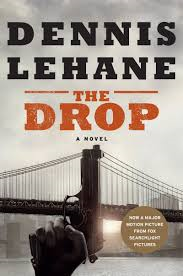 Frank Wilson, my friend and former editor at the Philadelphia Inquirer, offers a good review of Dennis Lehane's crime thriller The Drop in today's Inquirer. Bob works at Cousin Marv's. Marv really is Bob's cousin, but the bar that bears Marv's name isn't really Marv's anymore. Controlling interest has fallen to some Chechen mobsters, who use the place to drop off the day's take from gambling, drugs, and prostitution for an overnight stay and a next-day pickup. So when two guys in ski masks - one with a pistol, the other with a shotgun - rip the joint off, it's lucky for Bob and Marv that all they get is the money the bar made that night, about five grand. Bob doesn't fail to notice the two guys could easily drop-kick him and Marv through the goalposts of life, but another thought distracts him: "I just want to raise the dog, he thought for some reason. I just want to teach it tricks and live more of this life." What makes The Drop so good is not just the pacing, which is just about right, but the mood, which mirrors perfectly Bob's supremely understated personality.